HDMI is designed to support both audio and video. So that is a YES. Only 1 cable is required to play media on your TV. How to fix audio playback on TV? 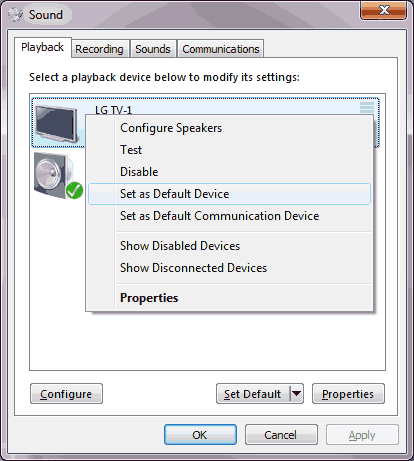 The audio device which plays the sound can be chosen in windows by choosing the appropriate audio output device. Follow the steps given below to change your audio output device to TV so that the sound plays on your TV instead of laptop. Now Right click on your TV and select set as default device. Now your sound should start playing. But whether audio is played on the target TV is dependent on the TV model, Some TV's might need some conifguration for the sound to play from it, otherwise the sound plays from the Laptop. So go over your TV menu to see if there is anything related. Check for common problems like muted laptop or muted TV and check all volumes. If still audio plays on laptop get an audio cable and connect your laptop audio to TV audio in. Check for loose HDMI connections. Check if your video card driver is installed and working correctly. Still if HDMI connection does not work, get your hardware checked up. The cable laptop or TV might have an issue. Make sure your laptop display settings is configured to use your second screen either in extended mode or in the cloned mode. 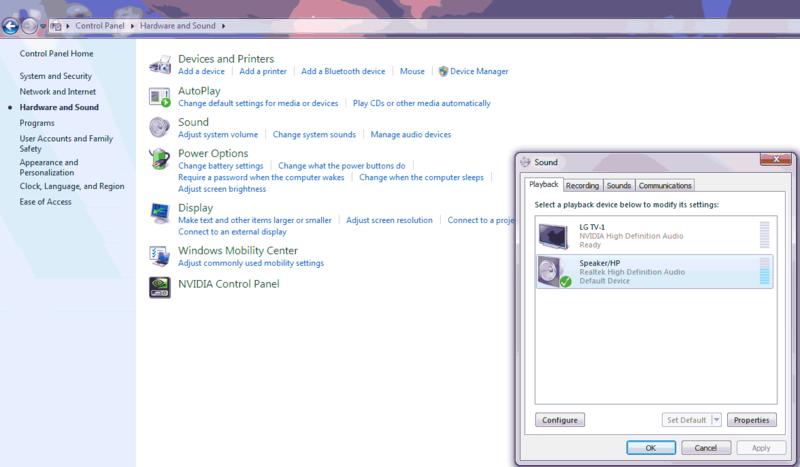 Try pressing the windows+P shortcut on windows and check your display settings as shown below. 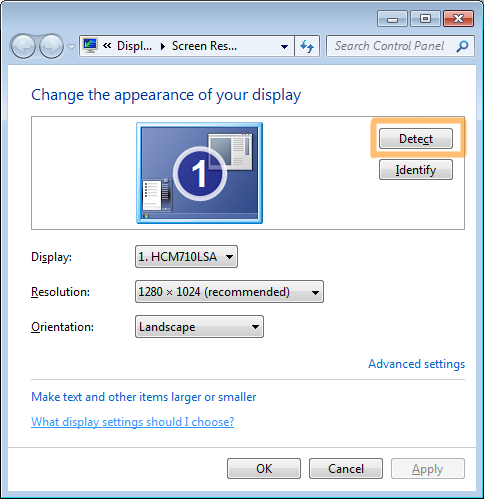 Click on Detect button to see if the newly connected HDMI monitors and TVs are recognized by windows. I have a 25Ft HDMI cable, when hooked up to my VIZIO TV from my laptop I don't get a display. When I hook up with the 6FT HDMI cable to my laptop, no problems. When I hook up the 25ft HDMI to my laptop to a smaller Sanyo (32") no problems. Hi there! It says that my tv is not connected to my computer even though the video is working... So i cannot press "set as default device"
Im having the same problem whilse connecting my laptop to tv using hdmi cable, i get picture on the tv but no audio!!! ive done all the settings as stated above too, but still no audio. does anyone know how to get it working? are HDMI plugs a complete waste of time and money if you can't get a full screen image through them when a VGA plug works fine? I have a sony bravio lcd tv and a gateway windows 7 laptop. I hooked up my hdmi for the first time last night. I went to controll panel and then used connect to projector. I used the extend window. I got a great picture on the tv but no volume. Can anyone help. I love watching classic rock video on Youtube. screen is till dark after i disconnect my labtop ? when i disconnect my labtop from my lg 50 inch through hdmi cable the screen on my labtop is still dark how do i fix this ? Try pressing the screen changing shortcuts usually found on Function key 7 (F7). My laptop has HDMI port but am only able to play the video on my LG LCD while the audio still comes from my laptop. could it be the quality of my HDMI cable that is causing this? hi there itried to connect my laptop hp g62 to my lg lcd full hd usig hdim cable connected with no problem but no sound from the tv can anyone please help. I'm having the same problem with no audio when I connect my laptop to my tv using a HDMI cable. I have a hp dv7 and a sony bravia tv with full hd.Did you ever find out how to fix this I could really use the help?